August 24, 2008 by Alphageek in "baker's bourbon alphageek"
This is a momentous day here at Alphageek headquarters. A bottle of bourbon has been emptied! This is both a happy occasion and a sad occasion. It is always difficult to say goodbye to a delicious bottle of bourbon, but it is also great to be able to cruise down to a liquor store and purchase some new bourbon to enjoy. 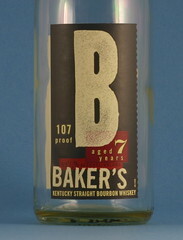 Pictured is a bottle of Baker's Bourbon. I purchased this because Mrs. Alphageek bought me a taste on a vacation and I really enjoyed this bourbon. It is smooth with an almost velvety taste. I think this makes an excellent gift idea for the bourbon consumer on any gift list. I will be stocking up on Wild Turkey this week. After all, football season starts shortly. I may also purchase something new to kick off the football season.